The first non-glacier resort in the Alps opened on Saturday, on what is believed to be it's earliest ever opening date. For the 4th time in a row, Kitzbühel repeats the stunt to open ahead of any other non-glacier ski area in the Alps. 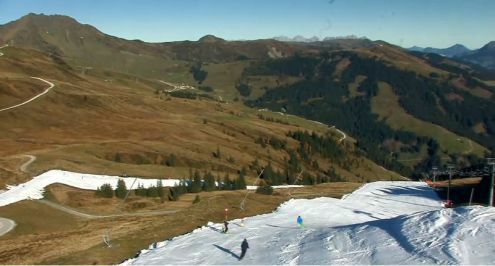 However Kitzbühel has not opened with new snow or even snow making but by using snow stored from last season. It’s a technique called snowharvesting and successfully used by several Scandinavian ski resorts with Ruka in Finland and Geilo in Norway opening the same way over the past few weeks. The Resterkogel/Resterhöhe area is operating at the weekend and hopes to open on a daily basis from 21st October. The famous Austrian resort plans to use the same technique to open a second area on the Hahnenkamm in 12 days’ time.The official opening for the entire Kitzbuhel ski area is scheduled for November 28th. Elsewhere in the Alps Cervinia has opened today for Saturday and Sunday snowsports on its glacier and will again next weekend too before opening permanent from the last weekend of October onwards. In the meantime, there is still some good glacier skiing to be had in the Alps. There are now 17 ski areas open in Europe for business, with more than half of them in Austria, where Kitzbühel in the 9th centre to open, following 8 glacier areas. The best snow conditions are in Austria where all the glaciers are open - Dachstein, Kitzsteinhorn, Stubai, Sölden, Hintertux, Pitztal, Kaunertal and Mölltal. Of these, Hintertux currently offers the greatest extent of skiing, with 35km of pistes served by 14 lifts. In France, the only option for the next few weeks will therefore be Tignes. In Italy, you can currently ski on the glaciers at Val Senales and Passo Stelvio, with Cervinia set to join them (at weekends only) this weekend and next, before opening daily from 28 October. In Switzerland you can ski on the glaciers above Zermatt, Saas-Fee and Engelberg.